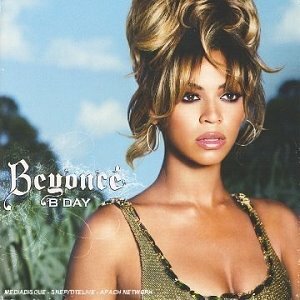 Beyonce has finally come up with her 2nd album, a follow up to her worldwide success of debut solo effort, Dangerously In Love. B’day is a birth to music industry with another quality worth buying collection of R&B tracks. I really fancy this album since the tracks are quite new to my ears. Congratulations to Beyonce for being creative enough to feed her listeners with some new cool songs. Generally, Beyonce and her co-producers seem to explore more varieties to the sounds in this album. Heavy drums, heavy beats, heavy sounds, and live instruments sound really fascinating. However, there is something that I find could be the minus point to this album. She is great singer but she showed off too much of her vocal prowess.The result is, she is rather screaming than singing in some of her songs. Poor her, she maybe forget that good vocal means good control. 2. Upgrade U: Tired of dancing to Deja-Vu?This one is designed to slow down your tempo!It’s such a soothing mid tempo hip hop track. As usual, a little help from Jay-Z is needed to make this track more enjoyable. 3. Get Me Bodied: I was really impressed that Beyonce could come up with this song. You can dance like a Bhangra with this tune. This track sounds more like a Bollywood soundtrack. An interesting song for you to Shake Your Booty! 4. Sugamama – Another good song which really tests Beyonce’s vocal capabilties. This song needs only the right soulful diva to deliver the tune.And Beyonce is the one. The formula is still the same with Work It Out. Heavy drumbeats and live instruments…Only the lyrics is different. 5. Ring The Alarm – The only thing you could remember about this song is a range of annoying sirens to mark the beginning fo the song. The sounds are too ‘alarming’ that only big woofers can present the distinctive sounds in this piece of work. The sirens often time overcasts the other musical instruments and you won’t be suprised why you don’t like the song. Perhaps after you watch her recent VMA 2006 performance of this song, you could deny this fact. At least she performed it very well on stage despite the poor musical arrangement in this song. 6. Kitty Kat – This is rather an extra track when Beyonce does not have enough songs to include in her album. The sound is too easy, nothing to say WOW about it. A typical Destiny’s Child sound. 7. Freakum Dress – I think this can be Ring The Alarm part 2 but the arrangement in this song is way much better. 8. Green Light – If all the other songs are too bouncy for you, this one is more decent in beats. You can dance to the right and to the left as this song can make you feel good time. 9. Irreplacable – Irreplacable and Turntable(by TLC). The title is alike and guitar strings are also alike,….hurmm is it from the same song writer(s)?. I’m quite relieved that we at least have a ballad song to die for. 10. Resentment – Soull influence brings us to the Motown era in this song. Maybe this will be featured in her upcoming movie, Dreamgirls.Who knows?? WHAT!I SPENT 3 HOURS ON LISTENING N ANALYSING THIS ALBUM AND ALL YOU CAN SAY THEY ARE NOT MY OWN WORDS!AND THE PRESENTATION WAS DISORGANISED?? ?i ADMIT MY PROB WITH THE PRTESENTATION PART BUT YOUR WORDS ARE FAR TOO HARSH TO APPRECIATE OTHER PEOPLE’S CONTRIBUTION….MIND YOUR WORDS…. yo~calm down~sorry dude if u feel that offended. btw, i use the copyscape tool and found that the writings were similar to some sites. perhaps you can use link next time. well, if you find it harsh and brutally honsst, i feel sorry. but that’s how i learn my mistake. people have been harsh on me and u’ll improve it alot. don’t worry. simon cowell make lots of money by doing critique.